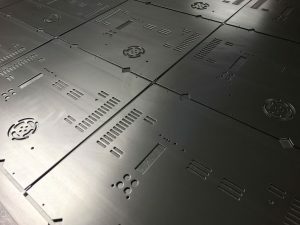 Where can I buy laser cut sheet metal work to my designs? We offer the complete laser cutting service from 3D modelling, CAD/CAM program development, laser cutting and down stream production processes. Using Radan 2017 sheet metal CAD/CAM software we are able to take your 3D data in the form of STEP or SAT files. 2D drawings can also be acceptable of PDF files and we will calculate the correct developed blank sizes for you. 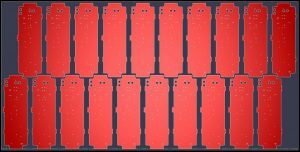 Using advanced nesting algorithms we can experiment with different nesting patterns to produce the most parts from any given sheet. This technique helps to reduce costs at the quoting stage and speeds up production cutting times. 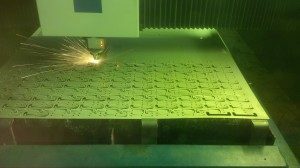 Here’s our Trumpf 3030 3KW fibre laser in action cutting 3mm thick galvanised mild steel with nitrogen gas. On this occasion we are only using part of a sheet for a small batch of work. We can laser cut up to 3M long with the largest sheet that can be laser cut being 3M x 1.5M in size. Here we have a recent laser cutting project that was produced using 5mm thick 5251 aluminium alloy. The nest was produced in seconds and worked perfectly to produce the parts needed by our customer. It doesn’t matter what the shape of the part we will get the best fit from the sheet saving you money. So where can I buy laser cut sheet metal work, V and F Sheet Metal. If you send us your drawings we will calculate a range of prices for you and any options you wish for material types and batch sizes. Call us on 01489 577786 for more information or send your data to sales@vandf.co.uk. Well it’s hard to think that a quarter of 2017 has gone past already. With time to look back I have picked out 3 sheet metal parts to show the versatility of our Trumpf 7036 CNC press brakes. All three parts were manufactured in batches around 100 to 200. They were all folded using standard tooling that we hold on the shelf and were all programmed within minutes of hitting the shop floor. With the recent investment of a third brand new machine we now have the perfect facility for folding small sheet metal brackets, angles gear trays, boxes etc. right here in Fareham, Hampshire. Sheet metal components up to 1M long are ideal for these machines and their fast acting electric drives produce very quick production cycle times. Add to that a simple programming and machine setting system making them idea for small batch volume work and prototyping as well as higher volume sub-contract sheet metal work. 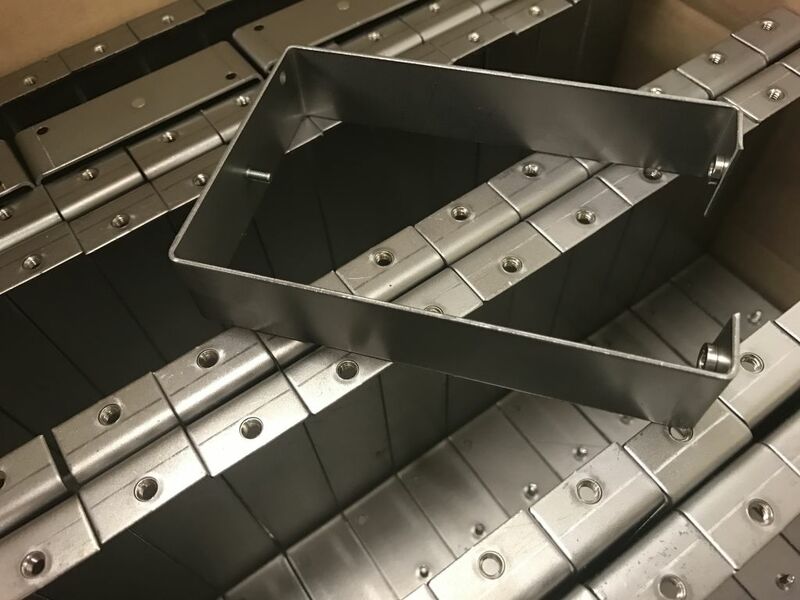 Whether your projects need sheet metal work containing such items as aluminium trays, stainless steel clamps, mild steel brackets or copper earth tags we can fold them up and maintain the highest tolerance and work quality at a very competitive price. We are always keen to look at new sheet metal bending projects and hope to keep our sheet metal factory busy throughout the rest on 2017. If you want more information on this service or have a look at your specific project please call us on 01489 577786 and our engineering team will be happy to help you. Our new Trumpf 7036 is now ready to bring extra bending capacity at V and F Sheet Metal. 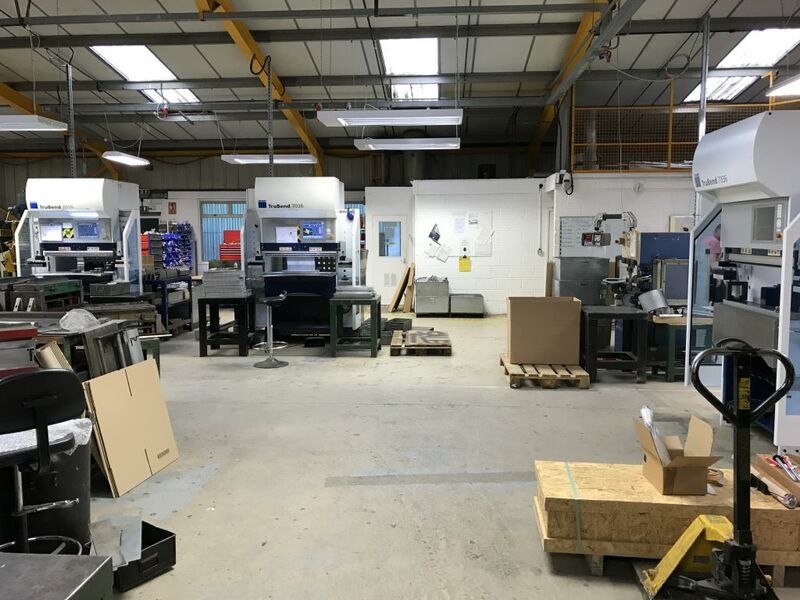 Working alongside our other two Trumpf 7036 CNC bending machines we think we may have the most on any single site in the UK. Always looking to invest in our services we are really proud to have another high tech bending machine working for our customers. If you are ever in Hampshire please feel free to contact us and call in to see the machines in action producing sheet metal work. 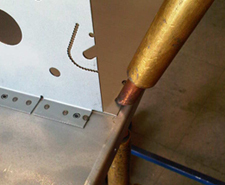 The extra bending capacity at V and F Sheet Metal makes an impact straight away by getting down to work. Folding hundreds of lighting reflectors with multiple bends the 7036 is soon earning its keep. 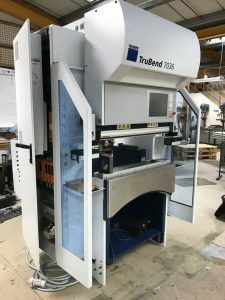 With common tooling across the range of machines and access to a huge database of existing CNC programs this machine will immediately be very productive. 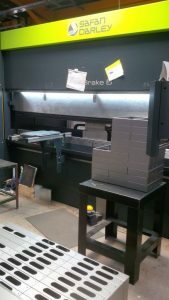 The new CNC bending machine is almost there and ready to take its place in our sheet metal bending facility. 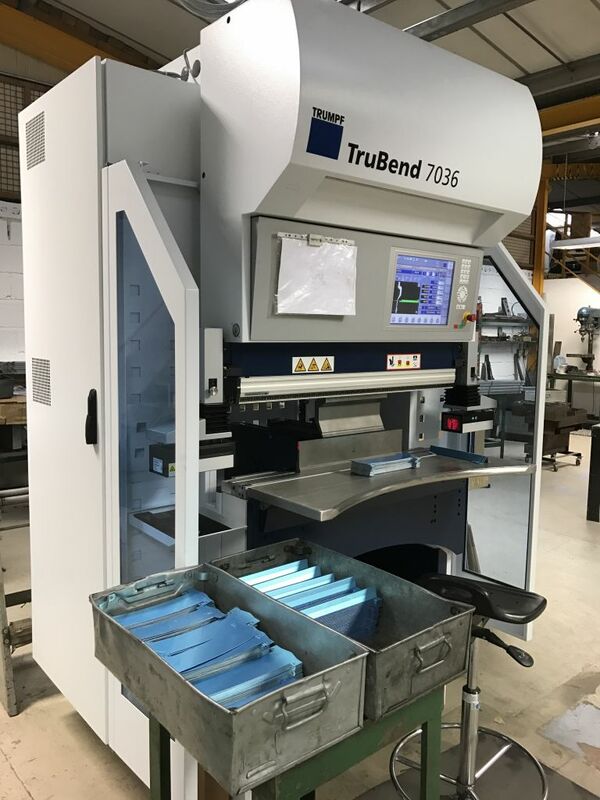 We have managed to move a couple of smaller CNC bending machines around so that our new Trumpf 7036 can sit with our other two 7036s making a very powerful bending cell. One of the smaller machines now sits next to our Trumpf 3030 fibre laser machine. This enables us to use it as a back up machine when the laser operator is watching a long running job. We are always trying to get the best of the machines we have and work in the smartest way we can. This helps us to keep prices down and reduce order lead times. With so much of our sheet metal manufacturing being under 1M long the Trumpf 7036 CNC press brake is perfect. 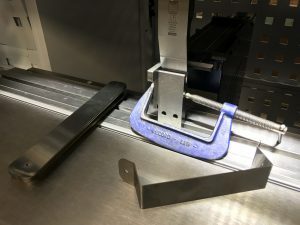 It’s ability to tackle the simplest single bend angle bracket right up to complex chassis work and multi-bend curved shapes makes it ideal for a busy sub-contract sheet metal work shop. We are really pleased to be able to announce a further investment here at V and F Sheet Metal. We have a third new Trumpf 7036 CNC press brake about to be delivered. This machine will increase our total CNC bending facility to 7 machines ranging from 60mm up to to 3000mm long. 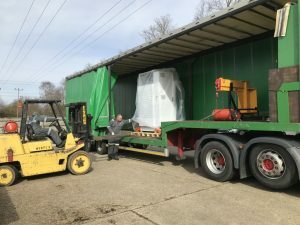 Our new Trumpf 7036 CNC press brake has come all the way from Austria and we can’t wait to get it off the lorry and into our factory. Should fit, I did measure it! Being so compact there is no chance that the new machine won’t fit. The machine was unloaded and positioned ready for commissioning within 1.5 hours, good work. 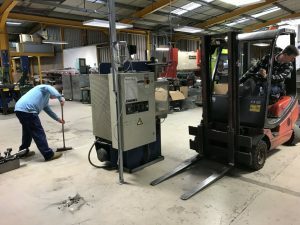 The machine was simply wired up, connected to our company computer network, set up and calibrated within the same day. Along with brand new tooling to expand our existing tooling library the machine was producing components on the same day, brilliant service from Trumpf, thanks. If you want more details on this new CNC press brake please read our Trumpf 7036 web page. Where is the best place to get sheet metal work in the UK? 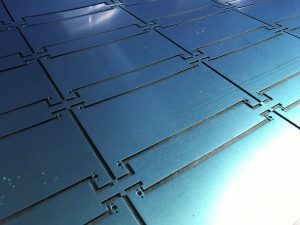 We believe V and F Sheet Metal are a good place to start your search for a supportive flexible sheet metal working company based in Hampshire UK. When you are selecting a sheet metal working company to partner you with your manufacturing needs you need a company who is prepared to listen to you and offer a range of ideas, manufacturing services and competitive prices. 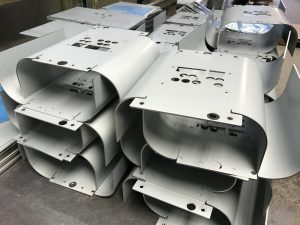 We have the ability to manufacture a wide range of sheet metal work in house using a comprehensive range of modern CNC productions techniques. Techniques ranging from CNC laser cutting, CNC punching and CNC bending to welding processes and many ancillary manufacturing processes allowing us to cope with the most demanding sheet metal work. 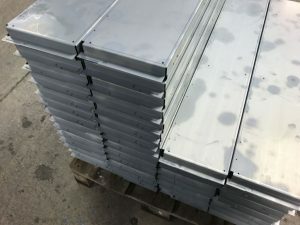 When you are looking for sheet metal work in the UK you want a company that speaks your language when it comes to talking through design ideas and possible ways to help you save time and money, we are here to help. Having the ability to provide CNC laser cut and CNC punched sheet metal work in the UK allows V and F Sheet Metal to give our customers a definite advantage when manufacturing in the UK. 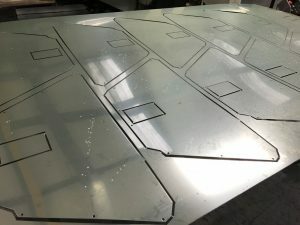 Whether you are only looking for a few laser cut stainless steel plates, some bent aluminium angles or a more complex welded fabricated enclosure we have the skills and equipment to help you. 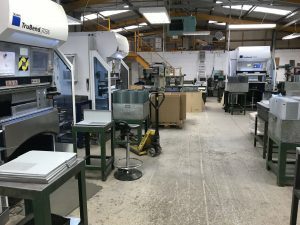 With connections to a wide range of treatment and finishing companies we can offer the complete project manufacturing service. Whether it’s a special one off project, regular batches of sheet metal work or larger volume projects we are here to support your needs. 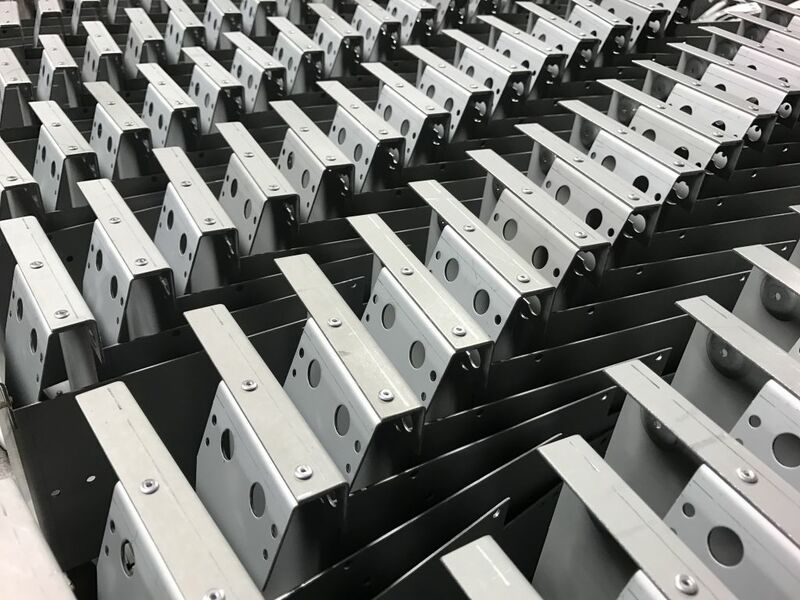 Sheet metal working is an exciting and growing industry with many new developments which have lead to the increased quality of work being produced often at reduced prices and with ever shorter lead times. 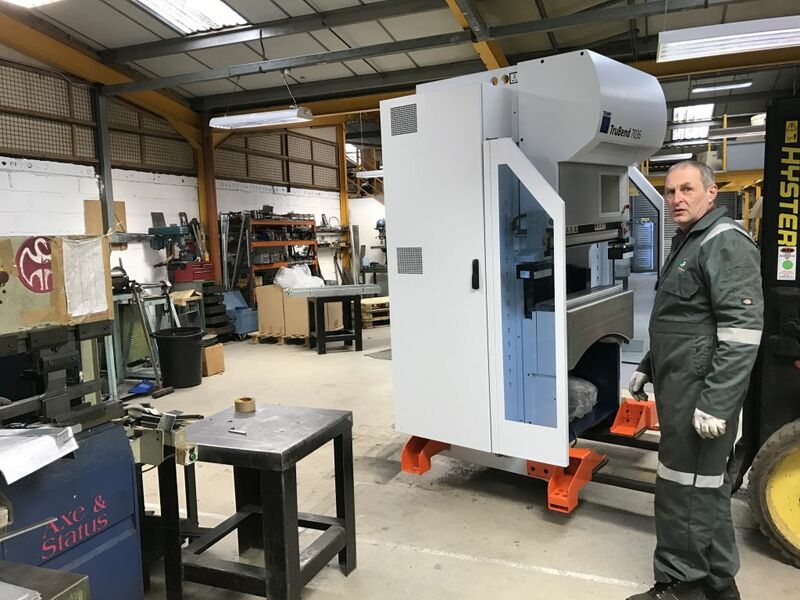 The ability to set up manufacturing machines in ever shorter times allows us to offer smaller batch sizes at the prices of larger productions runs of years gone by. This has enabled many of our customers to reduce stock holding requirements and still maintain their product lead times. So in conclusion if you are looking for sheet metal work in the UK then please give us a call on 01489 577786 or if you prefer send us your 3D design ideas or 2D drawings to sales@vandf.co.uk and our engineering team will be happy to help you out and produce competitive prices for you. If you are looking for a place where you can purchase sheet metal work in the UK then you should contact V and F Sheet Metal. Based in Fareham right on the M27 in Hampshire we are ideally placed to service local companies through Hampshire with their sheet metal working needs. 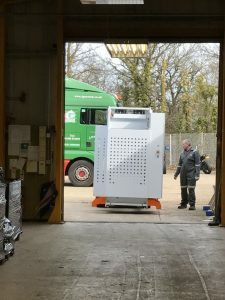 With connection to next day UK delivery we can be your local sheet metal worker wherever you are based in the UK. 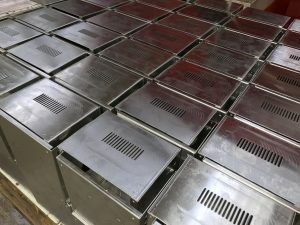 From simple one off projects and new design prototypes right up to high volume production we are ready to help you with your sheet metal work right here in the UK. The vast majority of the work we manufacture for our customers is repeating batches of many 10’s to many 100’s and we have just the right equipment to efficiently support them. Where can I purchase CNC folded sheet metal work in the UK? Having 6 CNC press brakes we are well placed to support you with folded sheet metal work up to 3M long. 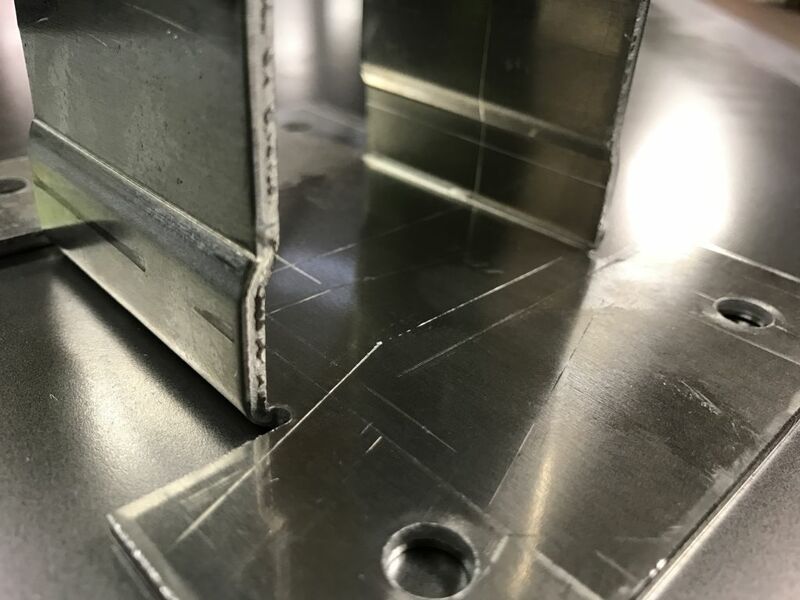 From the smallest angle clips and brackets right up to simple structure channels and angles we have the tooling and machines to help you produce your sheet metal designs. We have 2 Trumpf 7036 CNC press brakes which are idea for sheet metal work up to 1M long. They are so efficient at producing angles, boxes, covers and complex enclosures that we have another one on order and it will be installed during March 2017. 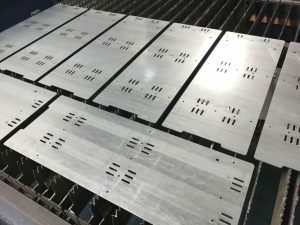 Where can I purchase CNC punched sheet metal work in the UK? 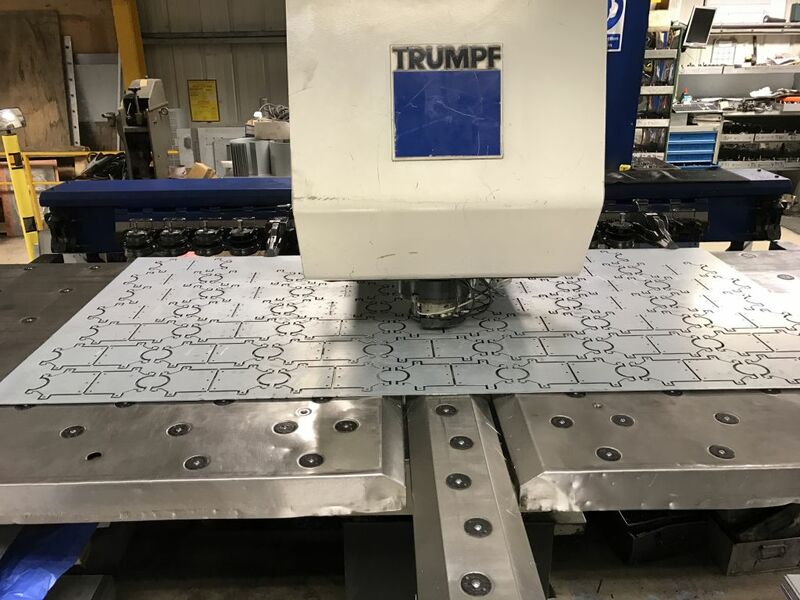 With both a Trumpf 200 and Trumpf 3000 CNC punch presses we are able to offer you an excellent service when it comes to CNC punching sheet metal work. We have a large library of standard and special CNC punching tools to help you with whatever design you want manufacturing. Where can I purchase sheet metal laser cutting in the UK? 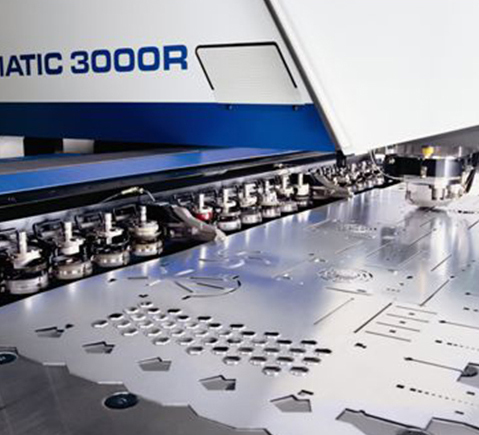 We have a Trumpf 3030 3KW fibre laser cutting machine and can use it to cut a vast array of sheet metal. 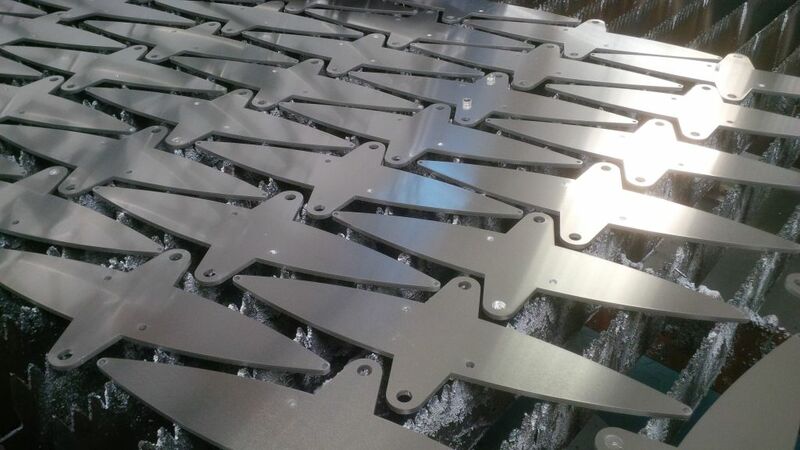 Laser cutting mild steel, stainless steel and zinc coated steels is no problem for us. We can also laser cut aluminium alloys and being a fibre laser we can also laser cut brass and copper sheet. Basically if you want to have sheet metal work produced in the UK we would be pleased to help you. Either give us a call on 01489 577786 or send our engineering team your drawings to sales@vandf.co.uk and we will produce some estimates for you. 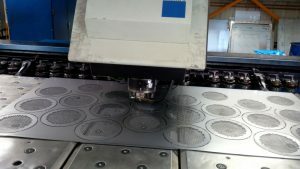 If you are looking for design ideas for CNC punching sheet metal parts then here are some useful tips for you. If you are looking for a particular shape to be produced by CNC punching it may not always be a standard shape we would have a tool for. By using a series of standard CNC punch press tools we can create a more complex or non standard shape. These ventilation slots are a great example of combining 2 shapes together to produce a the desired effect without the need for new special tooling. We have used a standard rectangle and standard obround slot to produce the correct shape for this customers sheet metal box. If you need to secure two components together you will probably want to use a screw. Your options could simple include a nut in assembly or we could press in a sheet metal insert such as a Hank bush to create a fixed thread point. We can also tap a thread directly into the sheet metal. This technique is nicely demonstrated here using our Trumpf 3000 CNC punch press. The thread has been formed straight into the sheet and is ready to use without any further production operations. Producing curved shapes in easy when laser cutting but needs a little more thought when using a CNC punch press. With the correct tooling curved shapes can be successfully produced. They may be large circular cut-outs, curved component outer profiles or curved slots such as these. This pattern of slots are used for a ventilation area with a small fan and was punched using curved banana tooling. And here’s the complete component in its CNC punched nest. 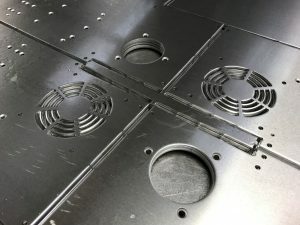 These are just a few of the design ideas which make CNC punching such a flexible technique when it comes to manufacturing sheet metal work in the UK. 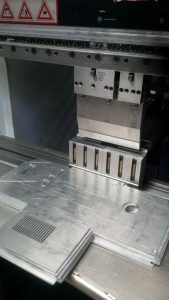 If you want to investigate further the standard CNC tooling we have available please take a look at our tooling pages. All these design features are supported by Radan CAD/CAM sheet metal software which we use across the board on our CNC punch press and laser cutting machines. If you are looking for design ideas for CNC punching your sheet metal project please give V and F Sheet Metal a call. We often save our customers money by suggesting alternative ideas using standard tooling that we already have on the shelf. 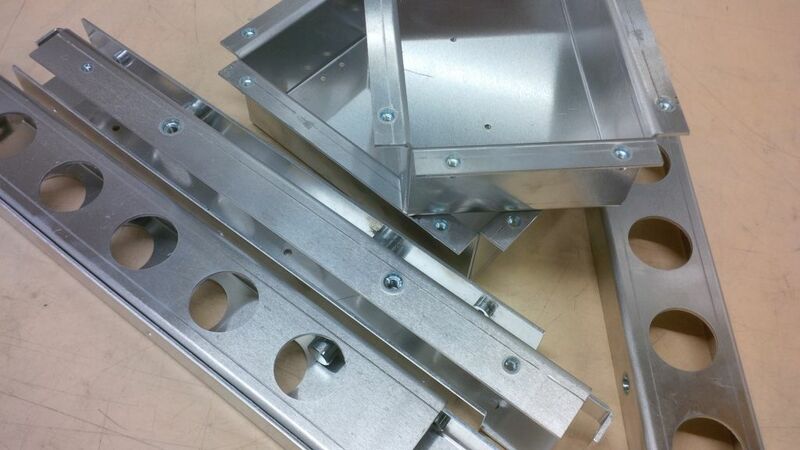 Most of the sheet metal work that we manufacture starts off as a 3D model. 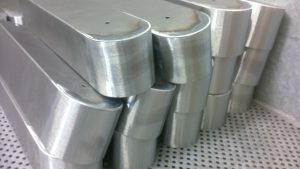 This could be a simple single part, 2 parts like this aluminium housing and cover or a more complex assembly of parts. The 3D model may be created entirely by us here at V and F Sheet Metal or it might be one given to us by our customers as either a SAT or STEP file. Either way the 3D model helps us to establish an unfolded blank size and check that all parts together correctly. A 3D model can also be helpful for our customers who don’t have 3D software as we can give them images to check out their own design before we commit to manufacturing and sheet metal work. If you look carefully you can see the aluminium housing shown in the 3D model unfolded and tooled up in a punching nest created by CNC programming. 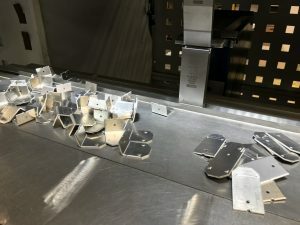 The other parts shown with the housing blanks are part of the same set of parts and were punched form the same material so speeding up production and saving what would have been waste material within the sheet. Any combination of parts form the same sheet is possible when using a Trumpf CNC punch press with its flexible single punching head. 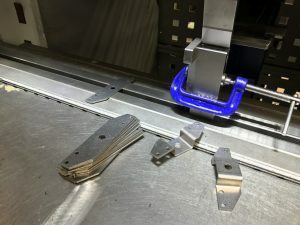 Being able to rotate all tools through 360 degrees in the head enables us to be really flexible when producing either prototype or production runs of sheet metal work. And finally here is an example of CNC programming being used to create a range of sheet metal parts all from the same sheet. The range of parts that can be produced using CNC programming techniques and CNC tooling is huge. 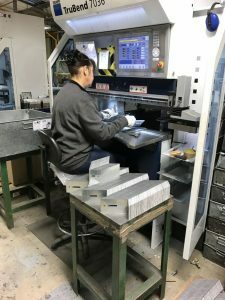 From small earth tags, support brackets, electronics front panels, lighting reflectors, sheet metal housings up to long punched sections and most with standard CNC punch press tooling that we hold on the shelf. If you have a sheet metal project and you are not sure whether it should be laser cut of CNC punched let us take a look for you. Using our CNC programming software we can produce test programs for both types of machines and feedback the best option for price before you finalise your design ideas. Perhaps you have a need for sheet metal angle brackets in your products. V and F Sheet Metal are based in the UK and here to help you quickly get the angle brackets you want. 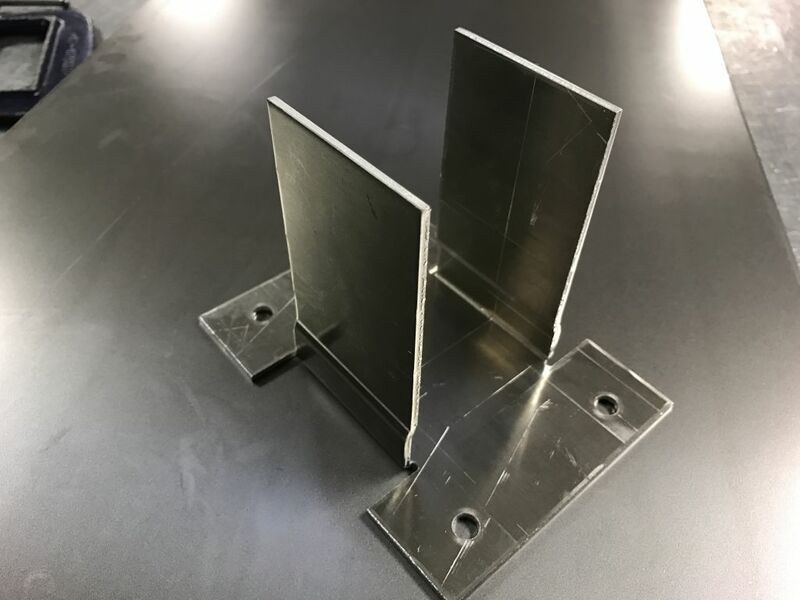 Whether they are simple galvanised steel angle brackets like the one shown here or much more complex brackets we can help you. With a range of CNC punching and CNC bending machines to produce accurate sheet metal flat blanks our CNC bending machines are feed with just the parts they need. Small sheet metal angle brackets with tolerance of +/-0.2mm on bends is no problem for us. The Trumpf 7036 CNC press brake is a great machine for this type of sheet metal bracket manufacturing. Very fast and accurate and so simple to set up for small batches of components. 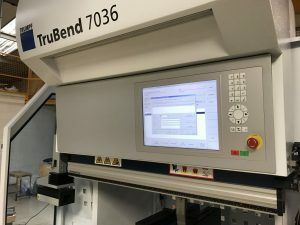 With standard CNC bend tooling on the shelf the vast majority of work we produce for our customers needs no new tooling keeping the costs down for each part made. The angle brackets show here were part of an order for 3 types of similar bracket and 6000 in total. The brackets were used in the building trade but we manufacture brackets for the electronics industry, lighting, heating equipment, professional audio equipment etc. If you have a bracket design please send it to us by e-mail or give us a call and we will be happy to chat through your ideas. We can often suggest a few simple changes to save you money when it comes to production. CNC punching sheet metal work can cover such a wide range of components. From small spring clips, mild steel angle brackets and aluminium front panels right up to stainless steel doors and galvanised steel drip trays. The CNC punch presses are the machines to have when it comes to producing sub-contact sheet metal and Trumpf are the best of the lot. With the Trumpf single had design we can produce complex shapes and designs very easily with our standard CNC punch tooling. Most parts are produced without any extra tooling costs for you. These sheet metal motor support brackets have been CNC programmed to fill the complete 2M x 1M sheet for maximum material efficiency. 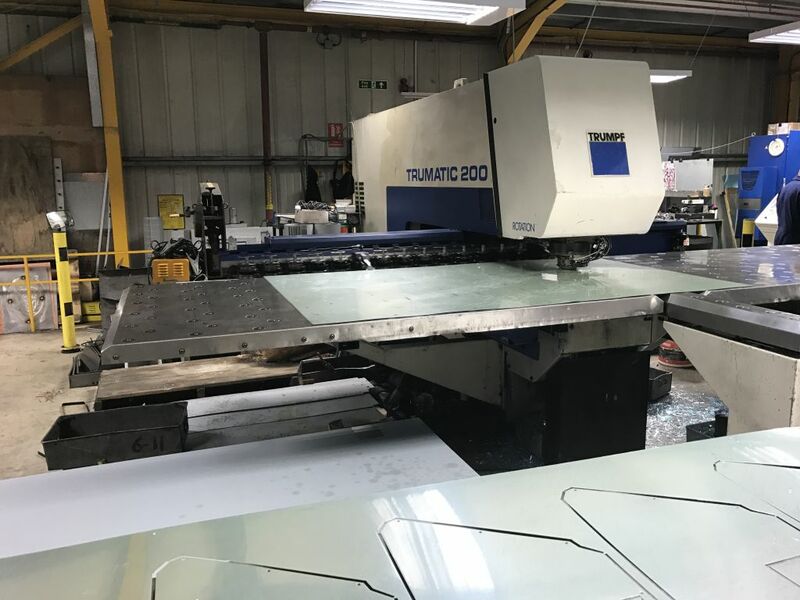 The Trumpf 200 machine shown here is supported by it’s bigger brother the Trumpf 3000 to offer a great sub-contract CNC punching sheet metal work service to companies right across the UK. When CNC punching isn’t quite right for a design, it’s no problem as we can also offer laser cutting with our Trumpf 3030 3KW fibre laser machine. Using radius tooling, standard round holes in multi-tool set ups and rectangular tools these components were each produces in seconds. V and F Sheet Metal have been CNC punching sheet metal work for over 30 years with a range of machines. These Trumpf machines are the best for accuracy and flexibility. 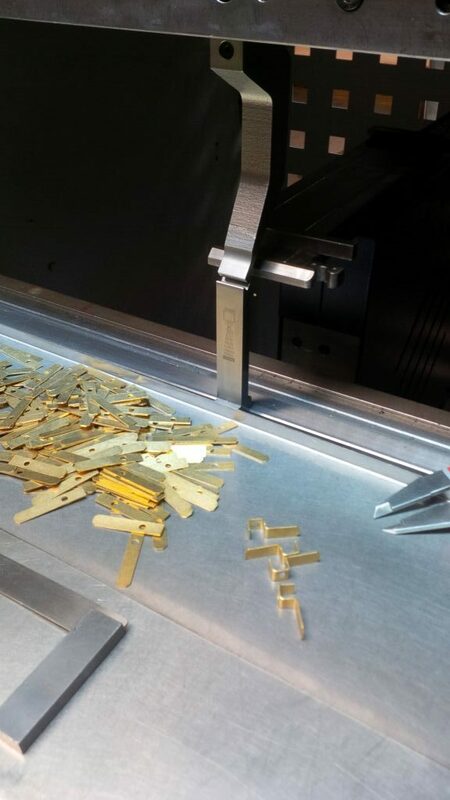 Components can be transferred between our two CNC punch presses and our laser cutting machine. This flexibity is supported by our Radan CNC programming software and on larger volume can lead to the same parts being produce together on different machines to reduce manufacturing times. 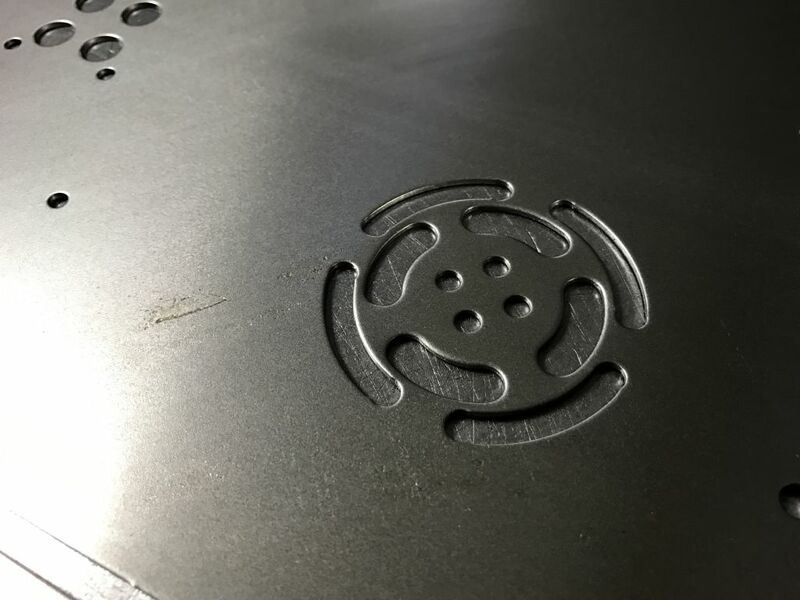 The best way to really understand how we can help you is to simply send in a new project or even a sheet metal CNC punching projects you are currently purchasing and we will be happy to give you some pricing alternatives. We have all the power we need to laser cut through galvanised mild steel. With the 3KW Trumpf 3030 fibre laser cutter we can produce parts faster than ever before. This service is a great bonus to you if you need a few parts in a hurry to prove a new design or perhaps you have an urgent requirement for sheet metal work to satisfy a short lead time order from your customer. 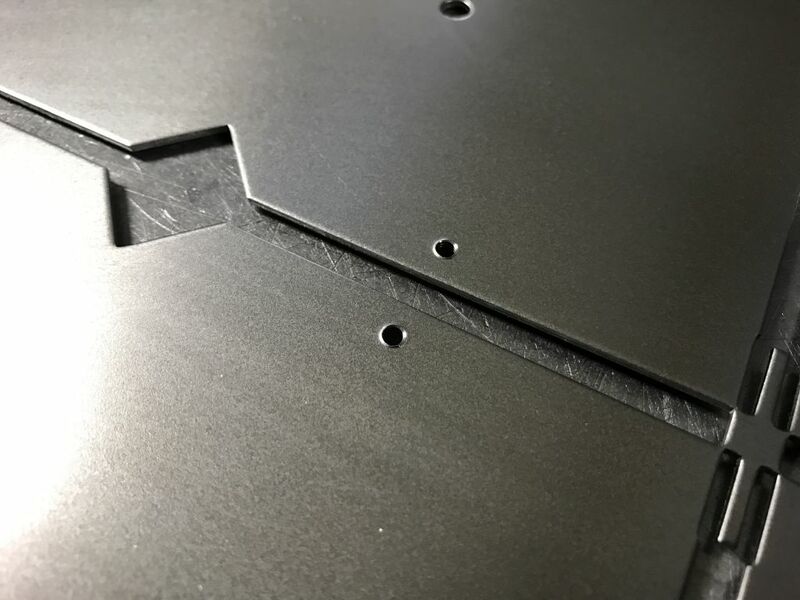 Laser cutting galvanised mild steel either with compressed air or pure nitrogen gas is easy for us with our powerful Radan CAD/CAM CNC programming software. This picture captures perfectly the explosive power of the laser cutter just as it’s piercing through 3mm thick galvanised mild steel. To see the speed of the laser cutter while cutting a range of materials and thicknesses take a look at our YouTube channel. Real life sheet metal projects laser cut in our factory in Fareham, Hampshire, UK. 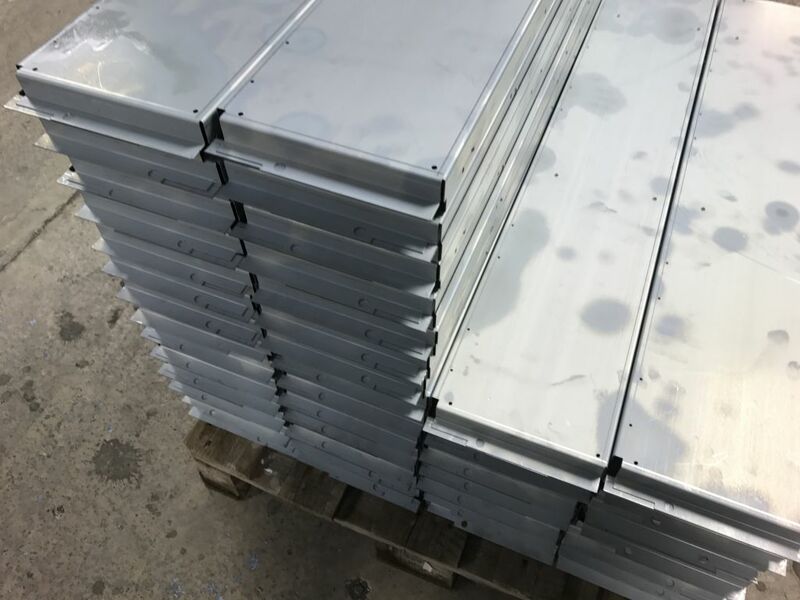 These galvanised mild steel plates were laser cut, edge de-burred and then folded up to size to produce mounting plate for LED display sign housings which we also manufactured in aluminium for our customer. The ideal place to start if you are looking for a sheet metal working company in Hampshire is V and F Sheet Metal. When you are looking to have sheet metal work manufactured for your own designs you will often need many different machining processes to successfully complete a project. V and F Sheet Metal have a wide range of manufacturing processes all under one roof in Fareham, Hampshire. Sheet metal work can be cut from fresh sheet by guillotining but nowadays we mainly CNC punch or laser cut the sheet metal blanks direct from standard sheet. This process enables us to CNC program the parts accurately and quickly to your design taking into account the material thickness, material type and any design features in the final component. Having both CNC punching and laser cutting under one roof enables us to quickly decide which production method is most suitable for your sheet metal work and get on and cut your parts without compromising on quality or delivery. 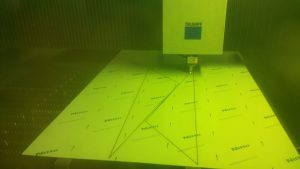 Here I have shown a photo of our Trumpf 3030 fibre laser cutting machine cutting through brass sheet metal. The fibre laser can cut through the brass sheet still leaving the peelable plastic coating in place to help protect the work in production and during transit to your factory. If you are looking for a sheet metal working company in Hampshire who can handle sheet metal work up to 3M long then I’m sure we can help you. With the ability to laser cut and fold up to 3M long we can handle most peoples requirements. Here’s a typical group of sheet metal work which we have produced in our factory in Fareham, Hampshire. These parts have been laser cut, edge de-burred, they have been CNC folded up and have sheet metal inserts pressed in place. What do I need to do next to gain an advantage? So, if you are looking for a sheet metal working company in Hampshire the first place you should be looking at is V and F Sheet Metal. Please give us a call on 01489 577786 to speak with our engineering team or e-mail us on sales@vandf.co.uk and we will be happy to take a look at your drawings and produce a range of price options and comments on your designs. 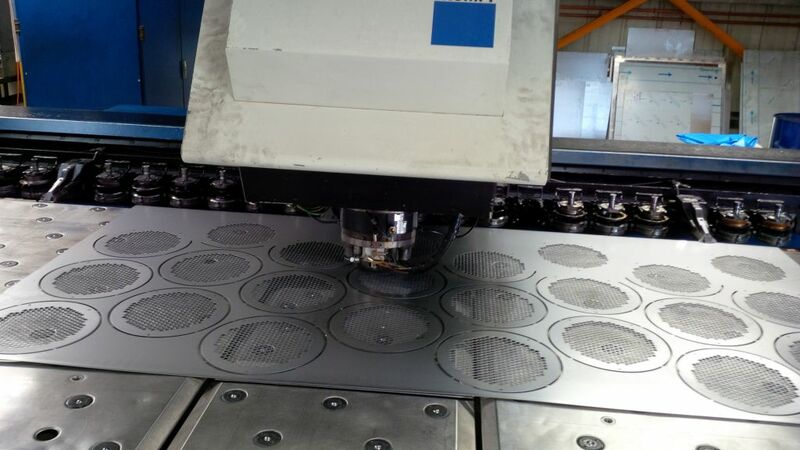 Here’s our Trumpf 200 CNC punch press busy producing CNC punched light fitting reflectors. This machine is more than capable of punching out all of these types of part. The reflector parts are normally 0.4mm to 0.5mm thick so machine tonnage is never an issue when you have 19 tons to play with. The reflector materials we use are special pre-anodised aluminium with protective peelable films to keep the reflective surfaces clean and scratch free while in production. The Trumpf 200 as another advantage in that its acceleration is smooth and the punching speed can be slowed down. This is great when it comes to the end of a CNC punched nest of parts from a whole sheet. 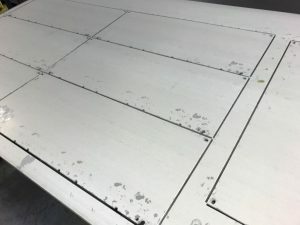 The final stages of CNC punching can make the sheet very weak and there is a risk that the very components we are trying to produce fall out of the next and we lose the whole sheet. With the Trumpf 200 this seldom happens enabling us to produce prices without the need for much allowance for scrap which is really useful with expensive light fitting reflector materials. 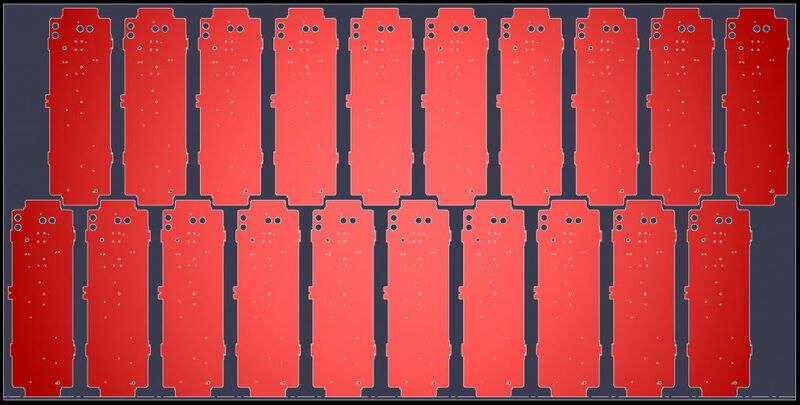 A closer look at the lighting reflectors being CNC punched in the image above. You can see that the components fit really nicely into the standard sheet size saving material and money. We would normally produce these parts in batches of 400 at a time and CNC punching is ideally suited to this type of work and volumes. 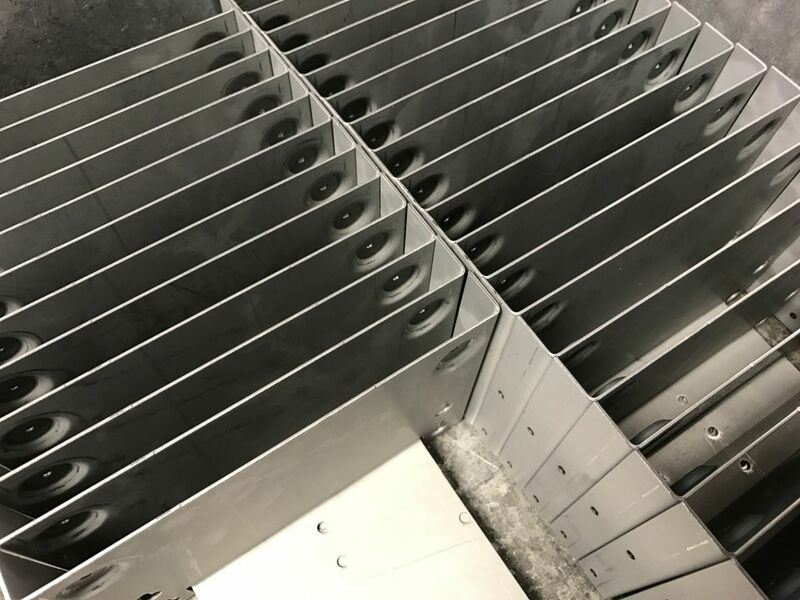 All the features shown here have been punched out with standard V and F Sheet Metal tooling and are freely available to you if you want any sheet metal work. A totally different light fitting project required thousands of CNC punched light fitting reflectors to be made in a short space of time. 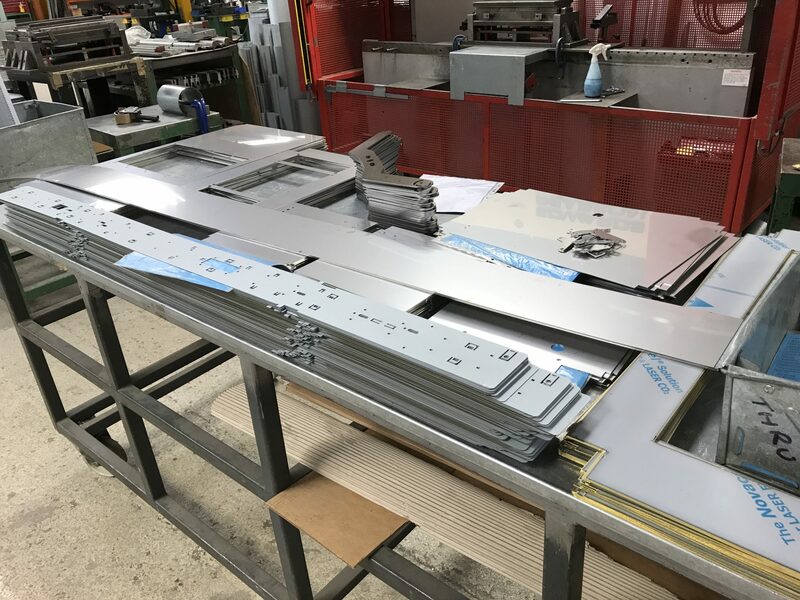 Again, the Trumpf 200 CNC punch press was used to produce many different light reflectors which were then folded up on our Trumpf 7036 CNC press brakes. The whole project took several weeks with over 120,000 bends being needed to complete all the parts. We have lots of examples of past sheet metal projects we have manufactured for the Lighting Industry, please follow the links here for more general information or our Lighting Reflector Gallery. If you have a light fitting project and you need lighting reflectors manufacturing out of sheet metal please give us a call and we will be happy help advise you and produce a range of prices if needed. 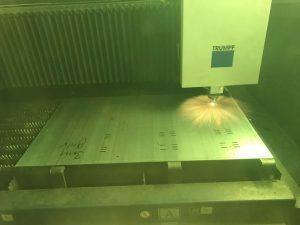 Sheet metal work laser cutting programs produced for our Trumpf 3030 fibre laser machine using Radan sheet metal CAD/CAM 2016 software. The images shown here are typical of the laser cutting programs used to manufacture sheet metal work with our laser cutting machine. The laser cutting programs can be used to cut a single part from a sheet, a full sheet of a single parts or a range of parts to make a set ready for a project. 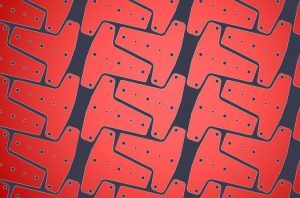 This flexibility in being able to quickly create a program that suits a one of part, small batch or higher volume part with the same software in essential when offering a sub-contact laser cutting service. The parts that we laser cut may simple be blanks used direct by our customers or the starting point for a more complex part that may be folded up and welded etc. We are always up with the latest version of Radan CAD/CAM software so that we can communicate with our customers using Solid Works or AutoCAD via DXF, DWG, STEP or SAT files. If you only have a PDF or JPG we can still take that information and create the right CAD data to program the laser and send you back a drawing if needed. If you want us to produce you some prices for your next sheet metal work order please send us your drawings to sales@vandf.co.uk and we will be happy to take a look for you. Sheet metal brackets containing joggled featured are often created by V and F Sheet Metal to meet our customers design requirements. Over the years we have built up a tooling library of simple tooling that we can use to press joggled forms in a range of materials and gauges. The joggles can be created either in the CNC press brake bending machines that we use or the flypresses that are used on smaller sheet metal work. Joggled sheet metal brackets are often needed to join 2 or more sections together which are a gauge apart. 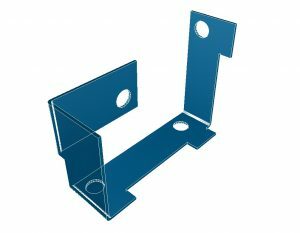 They a commonly used to enable sheet metal housings and covers to be fixed together with a smooth outer profile. 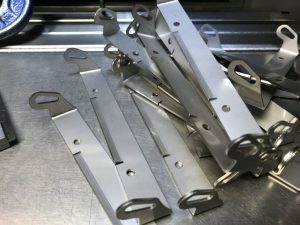 These simple joggled sheet metal brackets are typical of the type of sheet metal work that we are often called upon to help design and manufacture for our UK based customers. Sheet metal brackets such as these have been CNC punched, CNC bent and have joggled featured created with fly press tooling. We can adapt many of our joggle tools to suit a wide range of design features and may well already have a tool that can satisfy your design ideas. If you send us you drawings we will easily be able to check out our nearest tools by cutting a piece of stock material forming it to shape and reporting back to you. We can post it to you or send a photo all free of charge. Once you are happy we can then produce the production brackets knowing yo will get what you want. Send us your ideas to sales@vandf.co.uk or give our engineering / programming team a call on 01489 577786 and we will be happy to chat through your ideas and help where we can, again all for free. 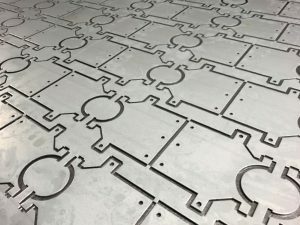 If you are looking for a great example of the versatility of CNC punching UK when it comes to producing sheet metal work, look no further. 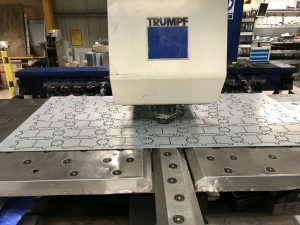 Using our Trumpf 3000 CNC punch press we have been able to punch out the profile, all the round holes and slots using standard CNC punch press tooling that we have on the shelf for any of our customers to use. The fan ventilation pattern was produced with custom tooling for a neat and quick solution in 3mm thick aluminium. 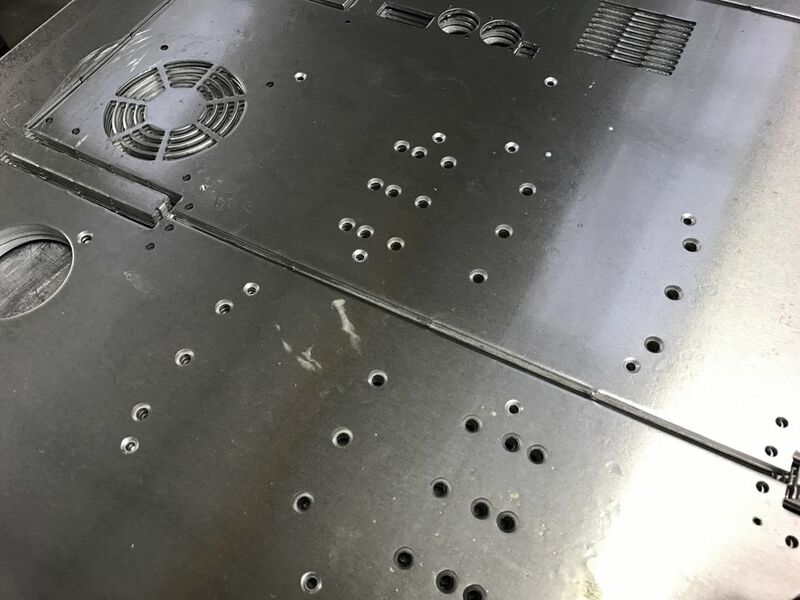 All the countersunk (CSK) hole forms have also been pressed into the sheet metal using a range of our own tooling after a pilot hole has been punched in the sheet. For a quick guide to all out standard CNC punch press tooling take a look at our tooling library. You should be able to find enough tooling to suit most of your sheet metal component design needs. 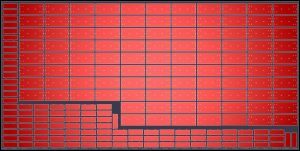 Many tools can be used in combination to create more complex patterns and cut-outs. Tools can also be hit and indexed multiple times to create longer slots or larger window cut-outs. If you are still not sure you only have to call our engineering programming team and we will be happy to help advise on the best tooling to use on any given material type and thickness. We also have a CNC punching gallery with many past projects to take a look at. 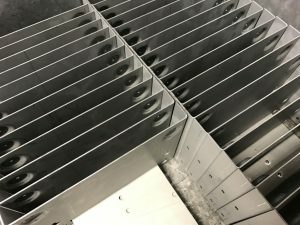 It may be that there is something that we have made in the past which can give you the inspiration you need when thinking of your new sheet metal component design. 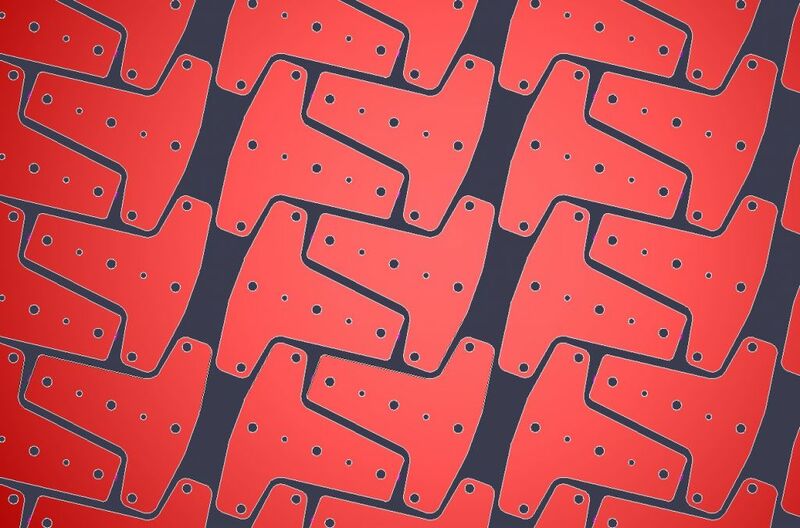 Still not sure about designing sheet metal products for CNC punching? So for CNC punching UK at its best please give V and F Sheet Metal a call on 01489 577786 or send us your drawings to sales@vandf.co.uk and we will be happy to produce estimates for you. 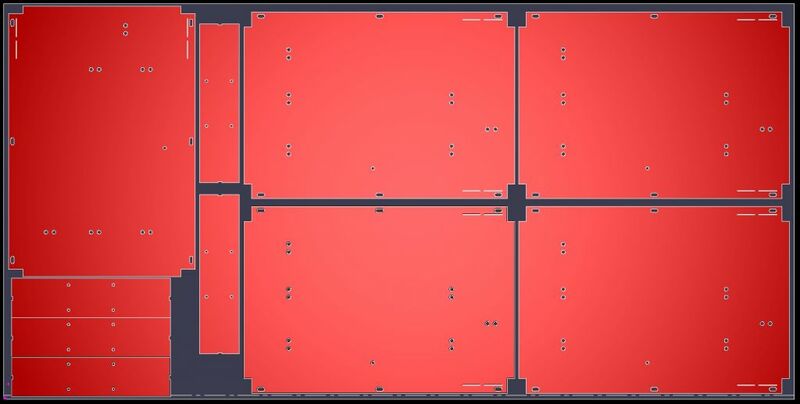 Sheet metal panels come in such a wide variety of shapes and sizes. These sheet metal panels have been CNC punched and CNC laser cut. The slightly green image is the laser cut panels viewed through the fibre laser safety glass of the laser cutting machine. 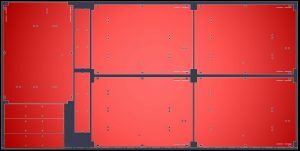 We have many examples of sheet metal panels on our website pages and blog posts. A good place to find more examples of sheet metal panels is our gallery pages. 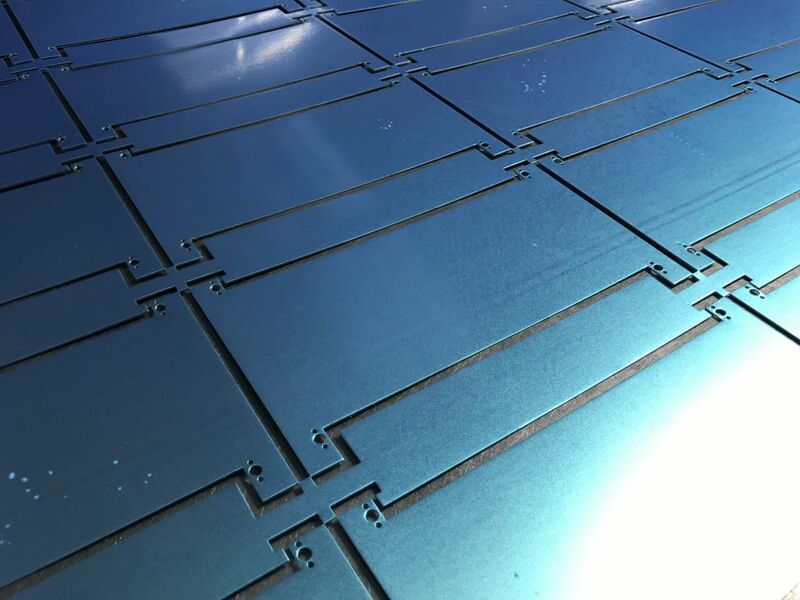 Which manufacturing machine we use depends on the material type, thickness and complexity of the sheet metal panels. If the panels are over 4mm thick they would definitely be laser cut. 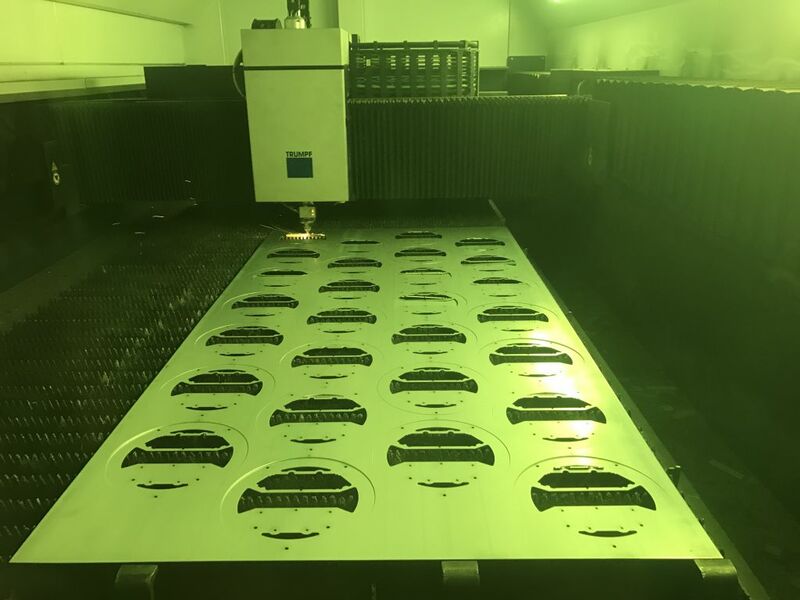 If the panels have very complex cut-outs or an outer profile that is difficult to produce without special CNC tooling then again they would be suitable for laser cutting. 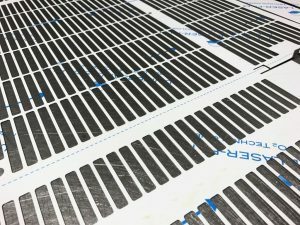 If however the panels have formed features such as tapped threads, formed ventilation louvres, raised dimples or self tapping screw forms then CNC punch would be the way to go. We can often produce panels with either machine and have on occasions made large batches on both types of machine together. This flexibility of manufacturing service is something we are proud to offer our customers. We are here to help wherever we can with a flexible approach to production and with free advice on designing for manufacturing. 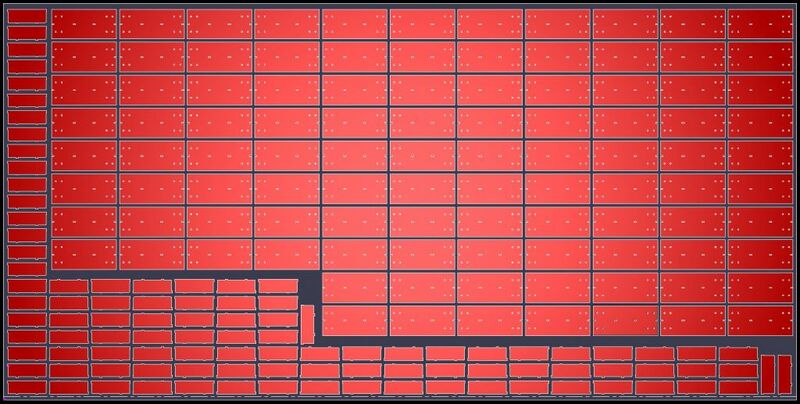 Perhaps you have some panels you need to have manufactured and you would like us to produce prices for you. Just send you drawings to sales@vandf.co.uk and we will be happy to take a look and help advise on your designs and offer competitive prices. Still not sure? Give us a call on 01489 577786 and we will be happy to chat. If you are looking for folded stainless steel brackets then V and F Sheet Metal have just the facility to help support you. Through 3D software modelling, CNC punching and laser cutting to CNC bending we will take care of the whole production process for you all under one roof. These folded stainless steel brackets are typical of the sub-contract sheet metal work that we produce every day of the week for our customers all over the UK. 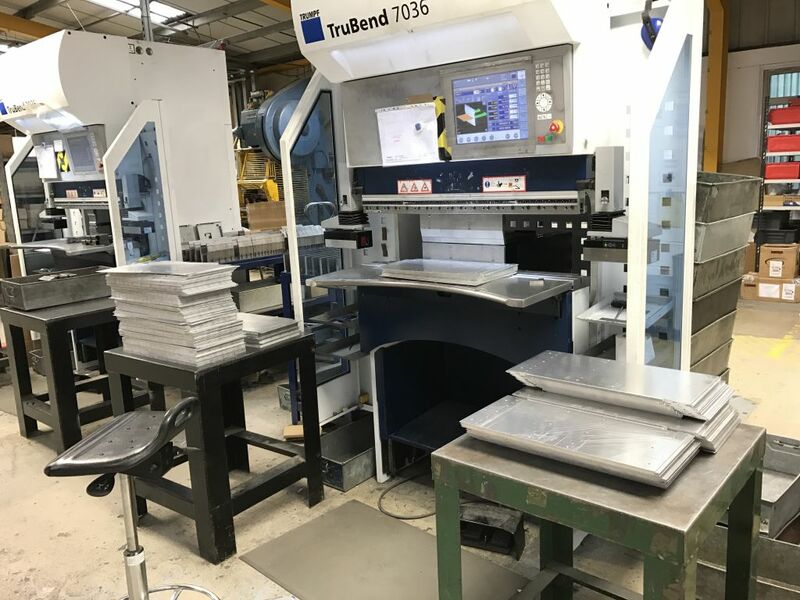 The Trumpf 7036 CNC press brakes we use to bend up small folded stainless steel brackets are ideally suited to this type of work. They are quick to program and set up as well as very fast in their production rates, all leading to very competitive prices for small and large batch metal work. 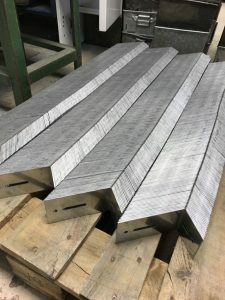 Although we have shown them folding up small stainless steel brackets they can fold sheet metal profiles up to 1M long and will cover the vast majority of the sheet metal folding that we produce in our factory in Fareham, Hampshire, UK. 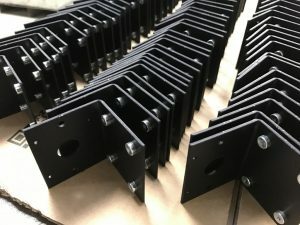 You can easily see that these brackets have radiused end and teardrop shaped holes which would have been very difficult to produce on a CNC punch press without bespoke tooling. With our Trumpf fibre laser these shapes are easy to produce and cost no more to produce than a standard square ended bracket with round holes. The Trumpf fibre laser machine really comes into its own when cutting thin sheet metal work or with small batches where the cost of CNC punch press tooling would not be viable. Putting these cutting and folding machines together truly offers you a great manufacturing service right here in the UK. Perhaps you have a sheet metal bracket that you need to have manufactured. Why not give us a call on 01489 577786 or send us your drawings to sales@vandf.co.uk. We will be happy to take a look and produce some prices for you. We can also see whether your design can be improved for manufacturing saving you further time and money. Here are just a few of the sheet metal projects that we have posted on our sheet metal blog this year. The range of materials, sizes and complexities of sheet metal work we manufacture never ceases to amaze me. I want to wish a big thanks to all our customers for their support and orders during 2016. Please keep your ideas and orders coming so we can expand our service and help you further in the future. CNC punch presses are so flexible when it comes to producing bespoke sheet metal work and our Trumpf machines are the best of the bunch. 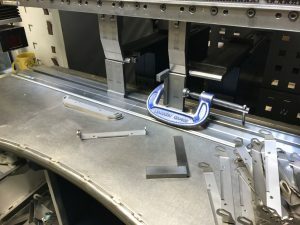 With their single head design allowing all punch and form tooling to rotate through 360 degrees we can produce some very complex components with the simplest of standard tooling that we have “on the shelf”. 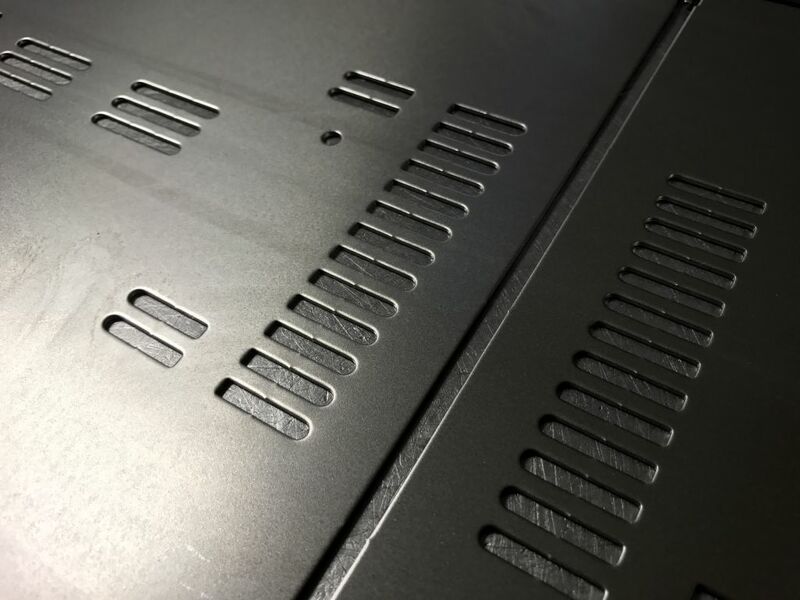 The ventilation grilles shown here were produced with standard CNC punch press tooling and one specially made bespoke tool. 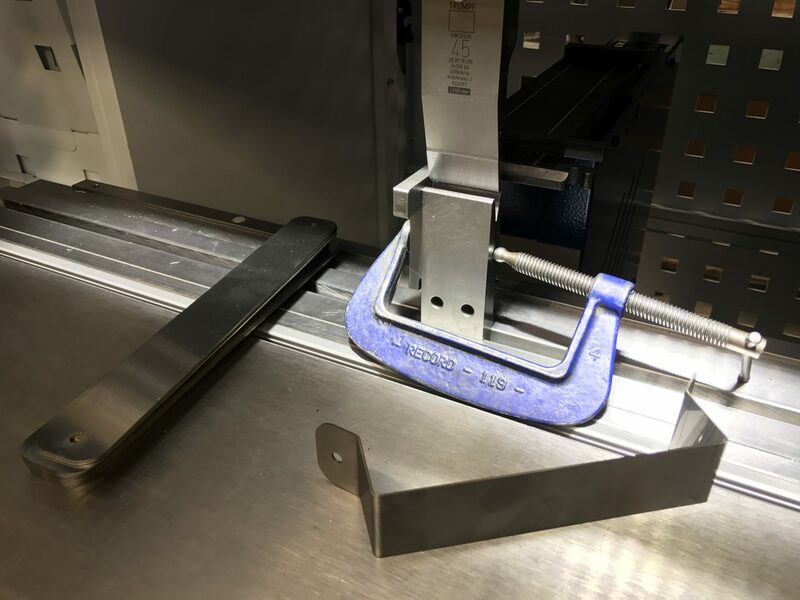 This special tool was purchased by our customer to allow us to produce a repeating pattern across a range of grille sizes for them quickly, cleanly and cheaply. The punch press video shows our Trumpf 3000R CNC punch press running with the presser foot option engaged. 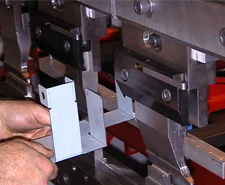 This system allows the stripper plate to positively press the sheet each time a hole is punched. This technique reduces the amount of distortion that is produced when CNC punching a series of close pitch holes such as the ventilation pattern in these sheet metal grilles. Run the video and you will see that even with the presser foot activated the machine still has an impressive turn of speed. 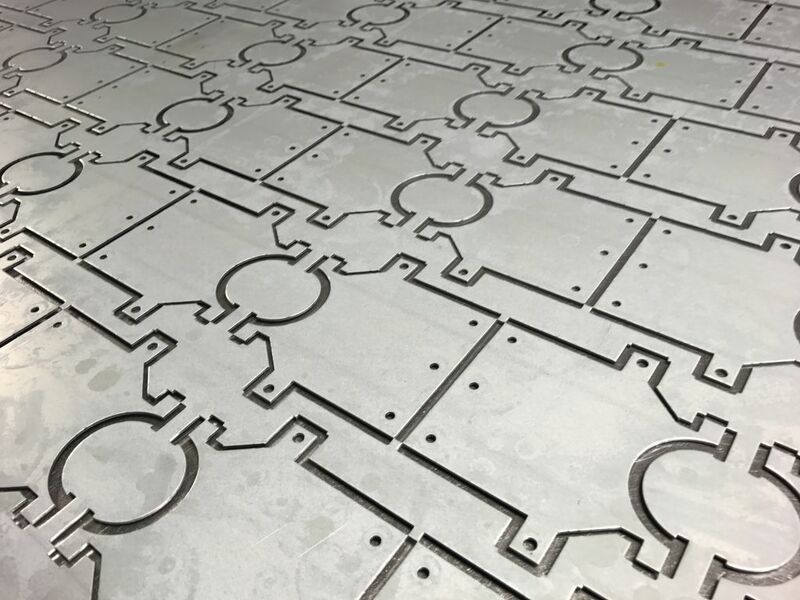 Perhaps you have a sheet metal working project that needs a ventilation pattern CNC punched, we have lots of standard tooling we can use for you. If you want a bespoke shape the tools are surprising cheap for the life and volume of work that they can produce. Please call us on 01489 577786 to discuss your project. 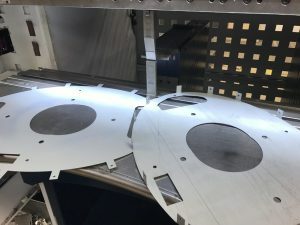 Just take one look at our Trumpf 3030 fibre laser cutting out these electronics enclosures and you will realise how flexible this machine is when it comes to producing sub-contract sheet metal work. 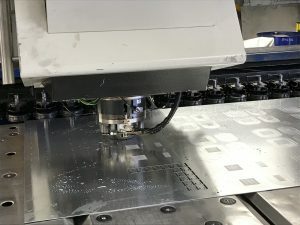 Whether it’s laser cutting special connector cutouts, complex outer profiles or intricate fan apertures this machine can cut through all sheet metal materials in seconds. We use our fibre laser cutter mainly on thinner gauges materials from 0.7mm to 3mm but it’s more than capable of laser cutting through 20mm mild steel. Driven by Radan sheet metal software it allows for the most efficient component nesting to keep material costs down and use up off cuts from parts projects. 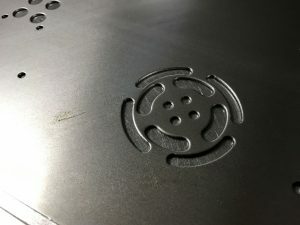 The fibre laser’s ability to cut through ferrous and non-ferrous materials including copper and brass set it apart from the traditional CO2 laser enabling us to offer you the complete sheet metal working service. 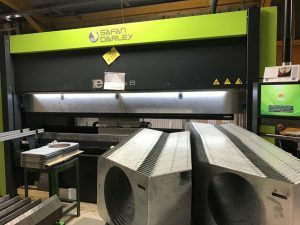 Our website has many pages and photo galleries illustrating the range of sheet metal work we have produced from this machine in the past 3 years. It still amazes me today the speed and accuracy of this machine of the wide range of work we get involved with for our customers across the UK. If you are ever passing Fareham, Hampshire and want to come and witness laser cutting in action feel free to drop in and say hello. If however you would prefer to e-mail us some drawings to sales@vandf.co.uk our engineering team is ready to produce competitive quotes fro you and help manage your laser cutting projects. 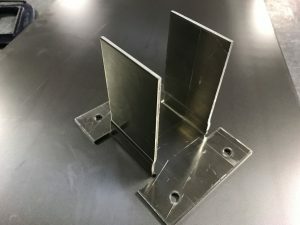 When you are looking for sheet metal brackets manufactured to your own designs you need to speak with V and F Sheet Metal. 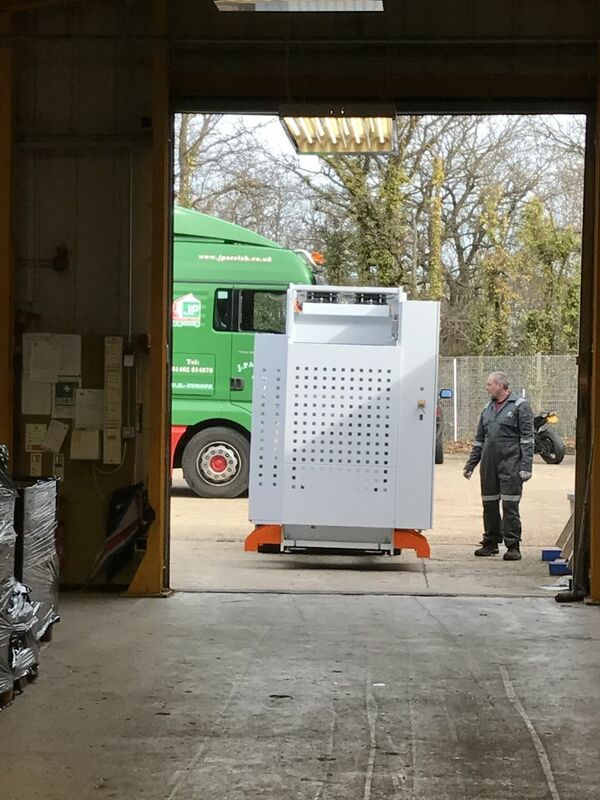 Based in Fareham, Hampshire we are ideally placed to service the sheet metal working needs of companies across the south of England and further afield. 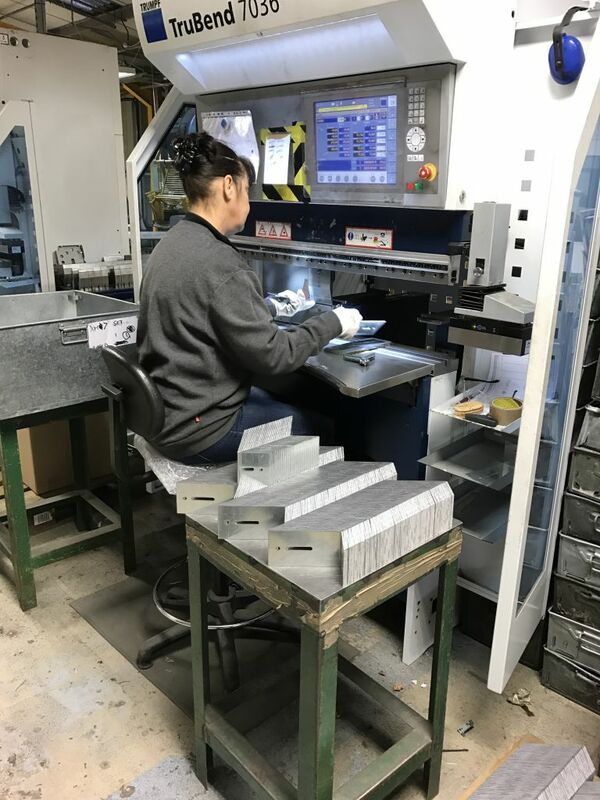 We love manufacturing sheet metal brackets and have all the equipment you could possible want to make the job of producing your bespoke brackets as easy as possible. From 3D CAD/CAM software to model your brackets. Through sheet metal bend blank development and bend allowances, CNC tooling and laser paths efficient CNC punch or CNC laser cutter nesting. 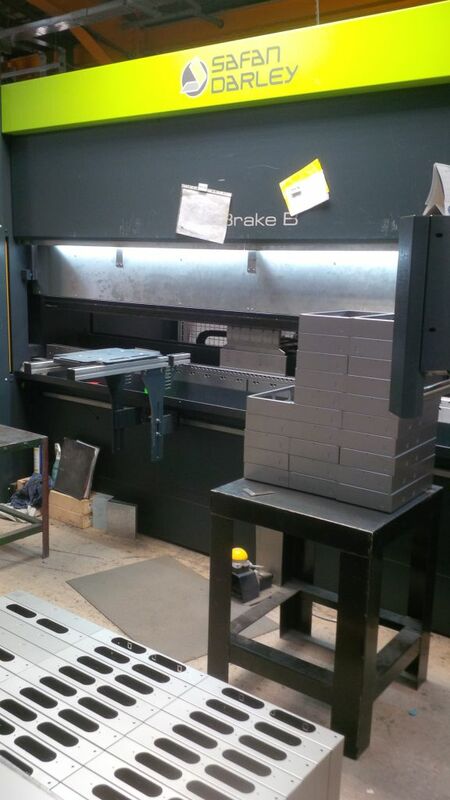 We have CNC bending machines that allow us to try out programs to calculate bend sequences and check off flat pattern sizes before committing to cutting and sheet metal materials. The CNC bending press brakes can handle a vast range of small brackets everyday ranging from small spring stainless steel angle brackets, electronics chassis aluminium support brackets, mild steel, zintec or galvanised steel clamping brackets, stainless steel mounting brackets through to copper bus bar brackets and pre-painted steel decorative brackets. 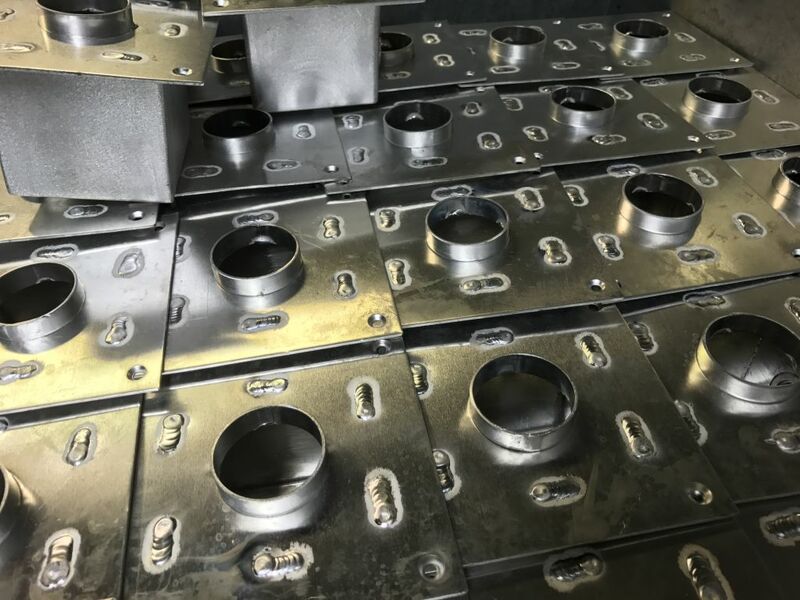 Where your bracket design needs manufacturing with plunged self tapping holes, threads built in, pressed in bushes, stand-offs and studs we can sort it all out for you. Perhaps you need to have several parts welded together to make a fabricated bracket assembly? We can cope with ferrous and non-ferrous MiG and TiG welding techniques as well as spot welding for lighter gauge brackets. 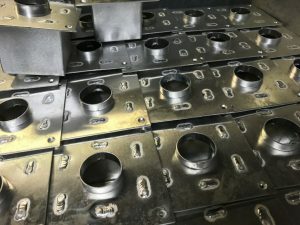 We will advise you on your designs if we feel they can be improved from manufacturing and always try and get the price down if we can see a better way of producing your brackets. For more examples of past sheet metal brackets projects please take a look at our bracket gallery page. If you have sheet metal brackets for a new project or possibly you are thinking about a new design then please send us your drawings in STEP, SAT, DXF, DWG or PDF format to sales@vandf.co.uk. If you are not sure quite sure what is possible please give our engineering team a call on 01489 577786 and we will be happy to chat through your options. Here are another 2 examples of folded sheet metal work recently produced within our production facilities in Fareham, Hampshire. These particular parts were manufactured for a lighting company and a ventilation company both based in Hampshire. With 6 CNC press brakes ranging from the small 600mm wide CNC press brakes for simple angle brackets and channels, through more complex brackets and chassis components on our Trumpf 7036 machines right up to our Safan e-Brake 3M 100 ton new CNC bending machine. 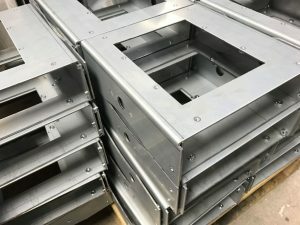 Whether it’s a few sample brackets for a new design, batches of folded profiles or custom built cabinet projects we have the folding capability to produce sheet metal work from as thin as 0.3mm tin plated mild steel screen cans, 0.9mm zintec angles brackets, 3mm aluminium enclosures, 5mm steel channels right up to 10mm thick steel support brackets. With the ability to save all CNC bending programs to our system server we can recall past projects within seconds and load up tooling to repeat parts without delay. For a fast and accurate service please give us a call on 01489 588876.